This page contains information on some of the exciting activities that you can take part in at the Victoria Falls. 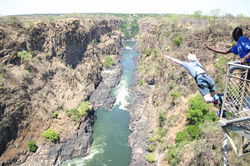 With the Falls behind you and the river rushing below the Victoria Falls Bridge this is no ordinary bungi jump. At 111 metres it is also one of the highest jumps in the world. The adrenalin rush is as wild as the river itself. There are two bungi options. A single jump on your own and a tandem jump with a partner. You meet at the Day Activity Centre at a time convenient to yourself and stroll to the Victoria Falls Bridge with your passport, passing through the Zambian immigration point. Including the walk the entire experience takes approximately 45 minutes to an hour. The bungi supervisors are there from 09.00 until 16.00. Jump whenever you feel like it. Probably the best way to appreciate the beauty, peace and wildlife of the Zambezi River above the Falls is to paddle slowly downstream in a canoe with some of the best wildlife guides in Africa. Watch the Pied Kingfisher hover and dive, listen to the haunting call of the fish eagle and the grunts of the hippo, see elephant, buffalo, and other animals come down to drink and explore the islands and waterways along the route. There is time to stop for something to eat and drink and listen to tales of Livingstone’s journey to the Falls. There are 4 ½ hour safaris which begin in the morning and include tea, coffee, soft drinks and snacks. 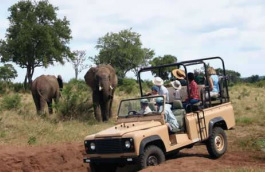 A full day safari lasts 9 hours and includes a cold lunch with wine, soft drinks and beer. Guests are picked up from the Day Activity Centre at 08.00 and dropped off there at 13.30 for a half-day and 17.00 for the full day safari. Children must be 12 or older to go for a full day and 10 or more to go on a ½ day safari. Price is the same for all ages. It is not often one can climb onto the back of an African Elephant and set off at an easy rolling pace in search of other wild game; wild elephant, giraffe, buffalo and much more. This is an elephant ‘experience’ and the guides are highly trained experts in the behaviour of elephants and the wildlife around them. Morning and afternoon, ½ day trails are available. The trails begin at Thorntree Lodge in the Mosi-oa-Tunya National Park an attractive lodge overlooking the Zambezi River. Tea, coffee and cordial are served on arrival. After a short introductory talk and safety-briefing guests are introduced to the elephants and their handlers before mounting the great animals. The handler and no more than two guests on each animal then head off through the riverine bush, crossing the river in shallow water to get onto islands. Halfway through the ride guests will dismount and interact with the elephants on the ground giving the guides an opportunity to make an interesting an informative explanation about the African Elephant and their relationship with man. Safaris in the morning last about 4 hours and end with a full English breakfast and the opportunity to view a video of each guest’s elephant ride. The price includes transfers, tea, coffee, breakfast and cordial drinks. Pick-up from the Day Activity Centre at 06.45, drop off at 11.00 hours. The afternoon safaris go on for about 4 hours with snacks at the end of the day and the opportunity to view a video of each guest’s elephant ride. The price includes transfers, tea, coffee, snacks and cordial drinks. Pick-up from the Day Activity Centre at 13.45, drop off at 19.30 hours. Children must be 10 years old or more. Children aged 10, 11 and 12 will be charged 50%. A guardian must accompany all children under 16 and a guardian must sign an indemnity form for all persons under 18. 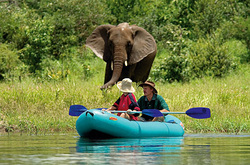 There is also an excellent elephant back safari available in Zimbabwe. This means crossing the border from Zambia. 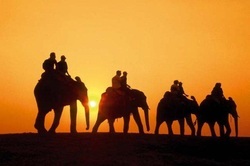 There is a morning or an afternoon safari where guests ride on the back of the elephants. Guests may also visit the elephant camp and not ride the animals but interact and learn more about them instead. The trails begin at an attractive lodge overlooking a waterhole in the wildlife sanctuaries not far from Victoria Falls. Tea, coffee, soft drinks and biscuits are served on arrival. After a short introductory talk and safety-briefing guests are introduced to the elephants and their handlers before mounting the great animals. The handler and no more than two guests on each animal then head off through the African ‘bushveldt’. Through interesting talks about the elephants and interacting with them guests learn a great deal about the African Elephant. This is more then just a ride on the back of an elephant. Safaris in the morning last for about 5 hours and include transfers, tea, coffee, biscuits, breakfast and drinks. Pick-up from the Day Activity Centre at 06.45, drop off at 12 noon. The afternoon safaris go on for 4 hours with drinks and snacks at the end of the day. Pick-up from the Day Activity centre at 14.45, drop off at 19.00. *There are visa implications for some nationalities. Minimum age is 5. An adult must accompany children under 14. Children between 5 and 11 are ½ price. The Zambezi is famous for one of the great freshwater game fish – The Tigerfish. Powerful, swift predators Tigerfish are a thrill to catch and require a great deal of skill. A good river specimen can weigh over 15 lbs. Bream, or Tilapia, also live in large numbers in the river and although they don’t fight quite as aggressively as the Tiger a good 5 lb fish will quickly snap light tackle given half the chance. Spinners and lures are the most common method of catching these fish although using light tackle, a fly and a fly-rod is becoming very popular and brings an extra dimension to a very exciting sport. Pick up at the Day Activity Centre. Drive to one of the launch sites. Board the boat and set off to the fishing grounds. A half-day trip either begins at 06.30 and ends at 13.30 or pick up is at 13.30 and drop off is at 18.30. Includes transfers, tea and coffee, full English breakfast, or lunch as applicable, soft drinks, beer and fishing tackle. No children under 12. Prices are the same for all ages. To put the Victoria Falls into perspective, they should be seen from the air. The sheer size and grandeur of the spectacle becomes clear from above. The huge Zambezi River flowing slowly south, hippos and crocodiles clearly visible in the shallow waters. Elephant quietly browsing on bright green islands as the water spreads across the full width of a great rent in the earth before crashing over the lip in a burst of spray then squeezing into a narrow, foaming, blast of water rushing down the zig zag funnel of the gorges. 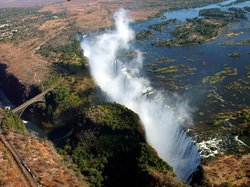 From a Helicopter – a 15-minute flight will take you over the Falls and the Zambezi River. A 30-minute flight will take you over the Falls, the Batoka Gorge, the Zambezi River and the Mosi-oa-Tunya National Park. Departure from the Day Activity Centre is at the guests’ convenience. Flights begin at 08.00 and continue until last light. Children under 4 are ½ price, children under 1 are free. From a Microlight – one person and an experienced pilot fly over the same sights as the other craft for either 15 or 30 minutes. Flights begin at 6.30 am and end at 10.30 am in the morning and start again at 3.00 pm and end at last light. 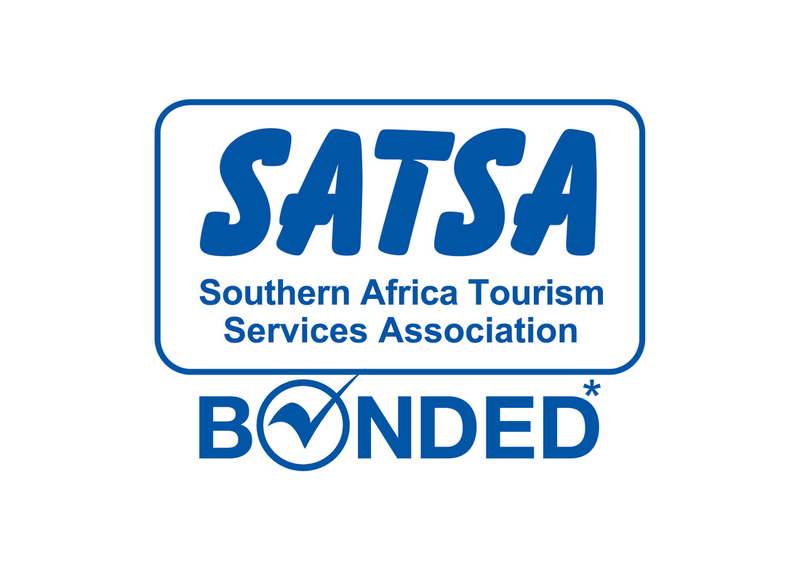 The minimum age is 8 however if a child is younger but big enough to fit into the harness then they are permitted to fly. Children are at full rate. The minimum age is 12. Children are at full rate. There are 3 ways to release adrenaline by going over the edge of a cliff face. Abseiling – slide 53 meters down the gorge on the end of a rope either facing the cliff face or looking down into the void. The walk out is up quite a steep slope but it is not far. Flying Fox – is a cable slide across the gorge high above the floor. You can sit on the ‘chair’ or be strapped, face down, looking at the ground far below as you fly across the gorge. No walk out necessary because you are pulled back. 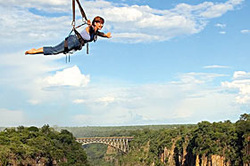 Gorge Swing – Fling yourself over the edge in a body harness falling some 50 meters and swinging right across the gorge and back until the momentum runs out and you are lowered to the ground to walk out. You may spend a whole day doing all three activities as often as you wish. Start early in the morning and spend 8 ½ hours dropping over the edge and climbing back up again. Transfers, a cold lunch, iced water and soft drinks are provided. Beers at the end of the day. Pick up at the Day activity Centre. Drive for about 20 minutes to the edge of the gorge. A half-day either begins at 09.00 and ends at 14.00 or pick up is at 13.30 and drop off is at 17.30. A full day begins at 09.00 and ends at 17.30. Children are welcome as long as they are big enough to fit into the harnesses. Children under 12 are ½ price. An adult must accompany children under 14. 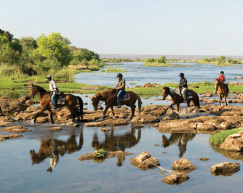 Enjoy the African bushveldt and the Zambezi River riding along the riverbanks on the back of a horse. Whether you are an experienced rider or a novice it is a very pleasant and peaceful way to see game and enjoy the birds and the ride. Animals are less disturbed by a person on a horse and it is quite possible to watch game at very close quarters. Experienced guides lead these trails and riders are put with friends or groups of similar riding abilities. There are 5-hour safaris which begin in the morning and include tea, coffee, soft drinks and snacks. A full day safari lasts 10 hours and includes a cold lunch with wine, soft drinks and beer. Guests are picked up from the Day Activity Centre at 08.00 and dropped off there at 13.00 for a half-day and 18.00 for the full day safari. Minimum age is 12. If a child has ridden before then it is at the guides’ discretion. Price is the same for all ages. Powerful Jet boats with huge jet engines blast down the rapids below the Victoria Falls at over 100 kilometres per hour. A thrilling half hour spent flying over the water and ‘buzzing’ rock faces between rapids 23 and 27. There are two departures, morning and afternoon and they include beer and cool drinks after the boat ride and at the top of the gorge after the climb out. Pick up at the Day Activity Centre at 09.00 or 14.30 and drive for half an hour to the edge of the gorge. Walk into the gorge and board the boat. The ride lasts for ½ an hour. Walk out of the gorge at the end. 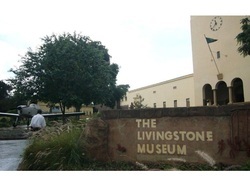 The Museum houses the most comprehensive memorabilia of the explorer and Missionary, Dr. David Livingstone. A guided tour offers an interesting sight into the life and work of one of the world’s great explorers. There are also very interesting displays on the Stone Age people who first lived in this area and an African cultural section that includes traditional living, medicines and witchcraft. Tours last for 2 hours and may be booked in the morning or the afternoon. This tour may be combined with other historical or cultural tours to make a full morning or day out with a very good lunch. Departure from the Day Activity Centre is at the clients’ convenience but pick up is usually 08.00 or 15.00. Tours include the services of a guide and bottled water. Children under 12 are ½ price, children under 2 are free. Livingstone was an important town in Southern Africa during the first days of European settlement and the beginnings of Colonial rule. It is well worth spending a couple of hours touring this historic town with a guide and learning about its past and the colourful people who created it. For many years Livingstone was the Railway Capital of a vast region and much of its wealth came from the railways. The museum is dedicated to that past and covers its history from the days when the bridge crossed the gorge to the building of the great TamZam railway in the late 1970s. For train buffs there are a unique collection of ancient locomotives and coaches. Each tour lasts 2 hours and may be booked in the morning or afternoon. These tours may be combined with other historical or cultural tours to make a full morning or day out with a very good lunch. This is the largest market in Livingstone - colourful, vibrant and bustling with activity. Here the local people sell everything; "chitengies" (brightly coloured fabric), fruit and vegetables, grains and rice, curios and pots and pans made out of old motorcars, farm tools, chickens, beads and clothes. This is where the people of Livingstone come to shop! A guide will accompany you and with the help of some bargaining skills some very interesting and authentic artefacts can be bought. A most unusual and rewarding experience for the clever shopper. The Park encompasses the Falls and stretches some 12 kms along the riverbank of the upper Zambezi. White Rhino, buffalo, hippo, crocodile, giraffe, zebra and several antelope species flourish here. Elephant often visit the park swimming back and forth across the river. Park entrance fees, soft drinks, beer and pastries. 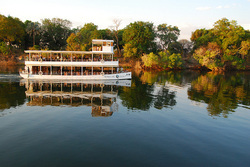 Met by staff from the African Queen and driven to the ‘Royal Landing’ jetty on the Zambezi River. Board an attractive cruise boat and make your way slowly upstream along the length of the Mosi - oa - Tunya National Park looking for game on the way. A number of animals and a host of bird species can be seen from comfortable chairs on cool decks. Excellent hot and cold food is served on board and the bar is well stocked with spirits, good wines, beers and soft drinks. All food and drink is included in the price and served throughout the cruise by professional, friendly waiters. Probably the most luxurious cruise on the river. 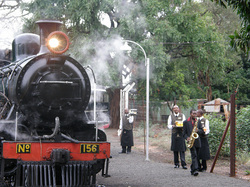 Transfers are from the Day Activity Centre and The Royal Livingstone reception. Pick up at 15.30 from May to August (winter), 16.00 from September to April (summer). The boat departs at 16.00, or 16.30 in the summer, from the Royal Landing. The cruise lasts for 2 hours and includes hot and cold snacks, drinks and transfers. Guests should be back at The Falls Resort at about 18.30 in the winter and 19.00 in the summer. All cruises include National Park fees, alcoholic and non-alcoholic drinks and food. Children under 12 are ½ price, children 4 and younger are free. Mukuni's Village is a Royal village which was founded around the 13th Century. It is home to about 7000 Leya people. 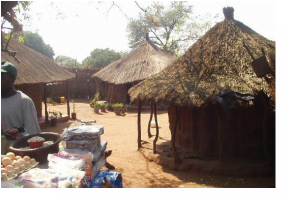 The chief has invited visitors into his village to get a glimpse of how his people have lived for generations and to learn a little about their traditional customs and beliefs. The Chief’s guides and the people of the village are more than happy to show visitors their huts and take you inside, explain how they are built and decorated, introduce you to various craftsmen and women at work and ask you to taste some traditional foods and beer. This is a working village, not a purpose built tourist attraction, and it is a privilege to be welcomed in. 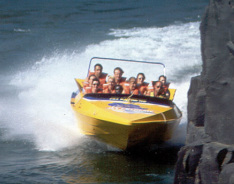 During low water, guests can do a full or half day trip. At the end of a full day or a half day PM trip, there is a lift out of the gorge. Low water rafting runs from about mid July to the end of January. The best months are usually August and September. A full day includes 21 rapids, lunch and 9 ½ hours in the day, including the walk out of the gorge and the drive home. A half-day trip in the morning takes in rapids 1 – 10, breakfast, a light lunch and drinks for the climb out. 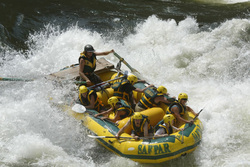 The afternoon rafting includes lunch, rapids 11 – 21, drinks for the climb out. Full Day. Pick up from the Day Activity Centre at 08.30 getting back at about 17.00. Half Day in the morning. Pick up from the Day Activity Centre at 08.30 getting back at about 13.30. Half Day in the afternoon. Pick up from the Day Activity Centre at 11.30 getting back at about 17.00. No children under 14 but if someone younger is big enough for the life jackets then they are welcome. Prices are the same for all ages. High water rafting runs from approximately the end of January to mid July. IF THE WATER IS TOO HIGH THE RIVER IS CLOSED FOR SAFETY REASONS - this usually happens between April and May. A full day begins with breakfast and takes up to 8 ½ hours through rapids 11 – 25 with lunch in the middle. This section of the river flows swiftly and features huge wave trains and whirlpools. There are drinks during the climb out. Full Day. Pick up from the Day Activity Centre at 08.00 getting back at about 16.00. Please note the water runs swiftly so half days are too short. The ‘full day’ can end sooner than 16.00 hrs depending on how fast the water is running. No children under 14 but if someone younger is big enough for the life jackets then they are welcome. Prices are the same for all ages. Discover the spectacular landscape surrounding Livingstone and the Batoka Gorge on all-terrain quad bikes. These ultimate adventure vehicles allow both the novice or experienced rider to explore the area at their own leisurely pace. Take in the panoramic views and wildlife with friends and family under the supervision of a qualified guide. Trips vary from eco trail riding at Batoka Land to longer range cultural trips in the African Bush.